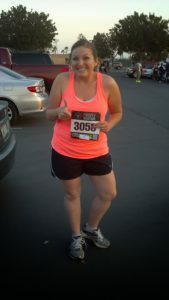 We have talked before about the Miracle Morning for Moms, and how you can adapt the program to meet your needs. Parents need peace and quiet as much as the next person (strike that: parents need peace and quiet MORE than the next person), and using the Miracle Morning for parents is a genius way to start your day with focus and intention. But when you’ve got small children at home, and a schedule that isn’t your own, carving out an hour a day is not an easy task. If the Miracle Morning isn’t working for you, you’ve got to find a way to work it that’s all your own. Oh, sweet, sweet silence. Something that is in VERY short supply in my house between the hours of 6:00 am and 7:45 pm. There is always something whirring, or someone yelling, or someone crying (sometimes it’s me). There is so much volume that I barely even hear it any more. The point of purposefully sitting in silence is to quiet your mind, and find some peace in your day. And trust me, that’s a lot easier to accomplish in a controlled environment, AKA one where the kids are unconscious. This one feels the cheesiest to me, but it also leads to the greatest results. With the affirmations, you take the chance to remind yourself that you are powerful, and strong, and that you can be who you want to be. As you have seen before, I use my Passion Planner to write out my affirmations. I took a little time once to write down all of the roles that I play, and what those roles entail. For example, I am a daughter- I need to call, engage, and support my parents. I am a friend- I need to connect with my squad, have fun with them, and help them when they are in need. I am a member of my community- I need to give of my time, play an active role in local politics, and make a difference when I can. The act of writing these down and spending time reviewing them each day keeps me focused on what I want to be defined as, and thus establishes my priorities. I can say I want to be a good friend until I’m blue in the face, but I need to take time to look at how my actions and time are supporting these goals if I want them to be true. Now you picture yourself carrying out your day, at least the important tasks. You walk yourself through your plans, what they will look like, how you will prepare for and execute each one. As a mom, this one feels the most useless (I’ll unload the dishwasher. Then I’ll rinse the dishes. And put them in. Repeat for eternity.) but I like to focus on what’s special about the day during this part. I try to use it as the opportunity to make my time with my kids more meaningful. For example, if we’ve got downtime from 12-2, I’ll picture myself writing a new blog post during Lila’s quiet time (which is a euphemism for TV time, naturally) and then having her help me make lemonade. 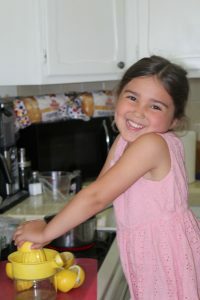 I’ll picture her sitting on the counter, squeezing the lemons, and laughing. Clearly, this is hopeful thinking. She might throw a lemon at me and cry in her room for the next thirty minutes. But visualizing helps me realize why I am doing these things, and what I’m hoping to accomplish with them. If things don’t go according to plan, it’ll help me remember that the plan was to spend time with my daughter. If lemonade-making isn’t accomplishing that, I’ll need to adjust to find something that will. Sigh. Exercise. I have a love-hate relationship with working out. Some months I’m loving it and wonder how I ever get by without it. And other months? I for sure get by without it. But planning for it first thing helps eliminate the procrastination and dread I sometimes associate with exercise, and for me that’s at least half the battle. If you aren’t the kind of person to rise and run, consider doing some yoga or pilates exercises. Any movement signals to your body that this day is going to happen on purpose, and gets the blood flowing for more intellectual efforts. Now is the time to break out your journals, your planners, or your laptops and get to writing. The writing can be anything from the reflective to the work-associated, but it’s important for your growth to put your thoughts on paper. Consider downloading the journal prompts from Hal himself, or freestyle in a journal of your own. It doesn’t have to be a novel, just a quick jotting down of thoughts to get your juices flowing. Now we’re going to use the term “plan” loosely here. The first time I attempted the Miracle Morning for parents, I intended to follow the steps in order. But then I realized that logistically, this just wasn’t going to happen. If I waited to exercise until the middle of my hour, that would put me leaving the house for a jog pretty close to Abe’s wakeup time, meaning that lacing up my sneakers and silencing the alarm would likely wake him up, and my plan would be foiled. 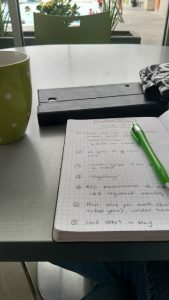 So I put my noisier activities, like leaving the house and brewing coffee (because COFFEE.) earlier in the morning, when the kids were deeper asleep. 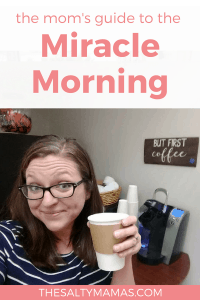 As an experienced Miracle Morning parent, I’m going to tell you what works for me (you can read about it in more detail here). I exercise for about twenty minutes, then drink my coffee in sweet silence while I attempt meditation for about five minutes (it’s a work in progress for me, for sure). 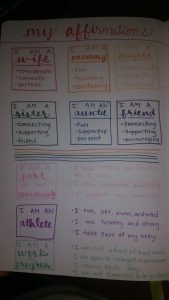 I read my affirmations, and do a quick visualization of the day’s key activities, which take about five minutes total. Then, as an extension of the days’ visualizations, I do some planning in my Passion Planner. I confirm the days events, send out reminders and emails to others as needed, and jot down some of the things I plan to accomplish that day. Some days, this is all I get to. Others, I have time to read a chapter of a book (sometimes personal development, but sometimes just for fun) and do some writing. I like to put these activities last, since they make executing the miracle morning with kids easier. If the kids get up earlier than expected, I can skip these without losing the sense of purpose the Miracle Morning for moms provides. And if they sleep longer, I’m more than happy to keep reading and writing until they do. You know what it reasonable for your house and what is not. If your kids are up and around at 5:30, you’re probably not trying to rise and shine at 4:30 to get the full hour in. Maybe you need a condensed half hour version. Maybe you need to move your exercise later in the day when the gym is open. Take an honest look at your schedule, and be realistic. Then write down what you think will be the ideal order for you, set an alarm, and get ready to give it a try. Silence that alarm, lay down your pilates mat, and get started on your Miracle Morning for parents. Work through as many steps as possible, and don’t worry if they feel a little awkward. Silence, affirmations, and visualization in particular tend to be a little awkward and take some practice. Give it a few days, and try to get a feel for what you enjoy and where in your Miracle Morning each task fits. You might find that you want to exercise last, or maybe that you ultimately want to skip one of the sections (I’m looking at you, Visualization). But give your plan a good college try before making adaptations. After seven consecutive mornings of being interrupted by a toddler crying for milk, you might find that the mornings are just not working for you. And that’s okay. Maybe you need to wait until the kids are up and occupied, or when they’re at the childcare at the gym, or even after they go to bed in the evening. Yes, in an ideal world, this is a beautiful way to start your day. But ultimately, what’s important is finding a way to intentionally build these positive and powerful behaviors into your life, whether that comes around at 5 am or 9 pm. You might also decide that a full hour is not for you. You might need to go through the motions a little quicker. 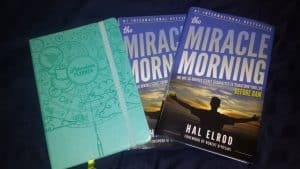 In fact, Hal Elrod has a plan in his book for a six minute Miracle Morning. You might be surprised how much you can accomplish in such a little time. Or you might want more time to engage in each of the practices, but find that you need to break it up throughout the day. I went through a phase where I did affirmations and visualization in the morning, planning/writing while the kids were watching a show in the morning, and got in my exercise, reading and writing while the kids were in the childcare at the gym. While it’s nice to have a dedicated hour, if it’s not working, you’re going to need to find a way to creatively get all of your needs met, however it may look. The most important thing you can take away from this post is that it’s not about the ideal Miracle Morning for parents, or the most effective, or even MY Miracle Morning. It’s about you, and when, where, and how you’ll take dedicated time out of your day to focus on yourself, your goals, and your plans for your life. So carve out a little space, incorporate what you’d like, and find your little miracle. Let us know what your Miracle Morning for moms would look like in the comments below! Love this post. I’ve never been sure of if I could do this but now I’m visualizing it better. I think I’ll give it a try!